Houston, Texas flooding: How El Nino and climate change contributed to the epic rainfall. 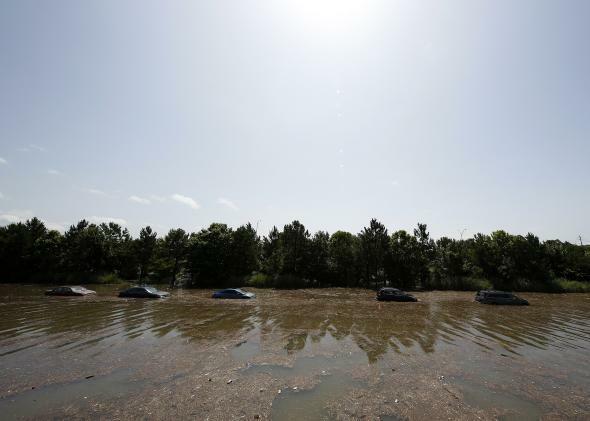 Vehicles are left stranded on Texas State Highway 288 in Houston, Texas on May 26, 2015. A torrential, hurricane-like series of rainstorms hit Texas over the weekend, stranding hundreds, and producing a flood that Texas Gov. Greg Abbott said hit with “tsunami-type power.” According to the Washington Post, at least five people have died and a dozen are missing—with the impact of the overnight rains in Houston still uncertain. Abbott has declared a state of emergency and called 37 counties disaster areas. During the rain’s peak Monday night, Houston received nearly an inch of rainfall in just five minutes, and racked up nearly a foot in less than a day. The flooding in Houston was comparable to a landfalling tropical storm or hurricane. Water levels along Buffalo Bayou, which runs through downtown, eclipsed the level seen during Hurricane Ike in 2008, and was just shy of flooding during Tropical Storm Allison—the worst flood in Houston history—which dawdled over the city for six days in 2001 and inundated 70,000 houses. And it’s not just Houston. At one point on Saturday, an astonishing 95 percent of Texas was under a flash flood watch as a huge swath of heavy rain slowly advanced eastward. One heartbreaking and widely circulated story recounted a frantic phone call from a mother in Wimberly, Texas, who told her sister “we are floating in a house that is now floating down the river.” The family is still listed among the missing. Water levels in Wimberly rose nearly 40 feet in a matter of hours, one of the worst flash floods in many meteorologists’ memories. Weeks of wet weather across the southern plains only made the Texas floods worse. May 2015 has been the rainiest month in Oklahoma City’s history—same goes for several other nearby places, including Fort Smith, Arkansas, and Wichita Falls, Texas. That’s helped all but eliminate one of the worst droughts on record, which peaked in 2011 and resurged again last year. Over the longer term, this kind of weather isn’t totally unexpected—extreme swings in precipitation are becoming the new normal. This month’s heavy rains are directly linked to a building El Niño in the tropical Pacific Ocean, which is forecast to strengthen throughout the summer, meaning heavy rains could return to the southern plains at regular intervals. A steadily escalating whipsaw between drought and flood is one of the most confident predictions of an atmosphere with enhanced evaporation rates—meaning, global warming. Since 1958, there’s been a 16 percent increase in the amount of rain falling in the heaviest rainstorms on the Plains, even as long-term projections point toward an increased risk of megadrought. Both of these can happen at the same time. Texas’s quick transition from drought hellscape to underwater theme park was egged on by both El Niño and climate change. A quick check of the latest seasonal forecast shows there’s a lot more rain to come this summer.